A hinges made in a decorative style. By blacksmith type handwork in contrast to cast work. The word wrought means made by hand and when coupled with iron it means any iron object made by forge-work. Wrought Iron Door Hinges : Details of the Eiffel Tower which was made from a form of wrought iron. Wrought Iron otherwise known as ductile iron or malleable iron is an iron alloy that has a low carbon content and contains fibrous inclusions one of which is slag. These give it a quality almost like the grain in timber. It is easy to work and to weld. It has been used since the 15Th. century in Europe but the word "Wrought Iron" came into the English language around the start of the industrial revolution when iron making became an industrial process. It is has been used for many construction products from the first metal bridges, to the Eiffel Tower. From iron water pipes to the hinges shown on this page. The material is not made commercially today, so it would have to be true that many of the companies advertising wrought iron gates or screens or hinges are using probably using plain mild steel. 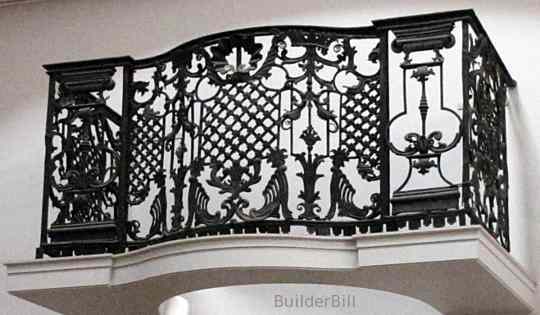 So what has happened is that it is not the material but the actual style that is now called wrought iron. Wrought Iron Door Hinges : A door seen in the old city centre of Bruges, in Belgium. 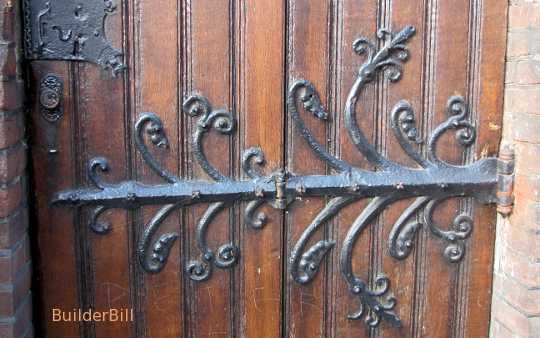 It is interesting to note that just about every piece of good wrought ironwork that I have seen, and I certainly include the ones on this page in that statement, is above all a practical object that does the job it was designed for and it does it well. The artistic or creative input of the maker is always an added bonus. The door above is a fine example of this. Still being used, probably on a daily basis for the last two hundred years or so. Wrought Iron Door Hinges : A door seen in a small village outside of Munich in Germany. Once again a totally practical working hinge that first of all does it's job and does it well. Again it is still functioning, not just a theme piece. It is a pity that the whole door is not getting some regular maintenance, as it would be a shame to see it disappear. 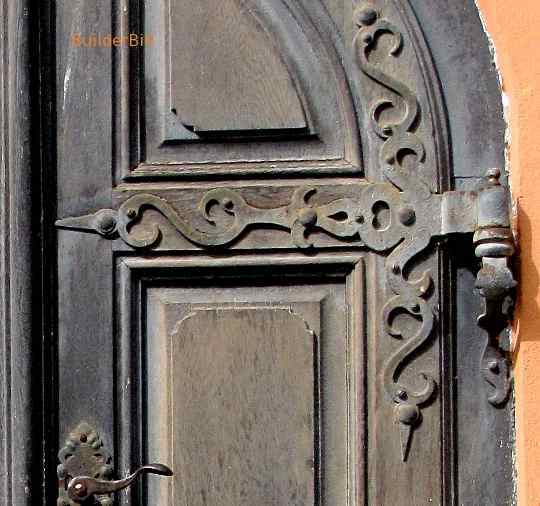 If you are looking for real wrought iron door hinges for for your restoration hardware that is true to type then you will have to go to an artisan - craftsman who is making true wrought iron in the traditional way at a blacksmith's forge using hand tools and methods that have been around since the middle ages. If you are looking for something of an antique door hing look then there are a lot of manufacturers do just that.